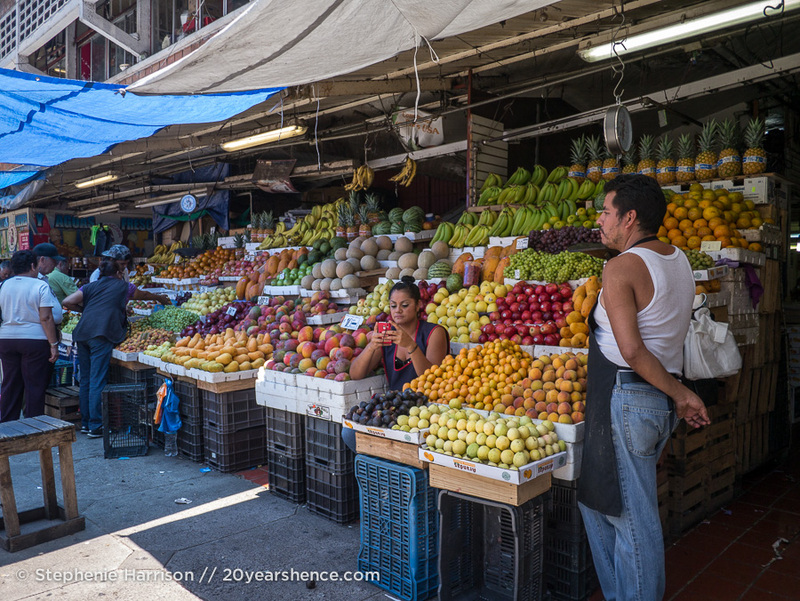 After our time in La Peñita, we knew that we wanted to head inland and experiment with Mexican city living to see if it was a better fit for us. 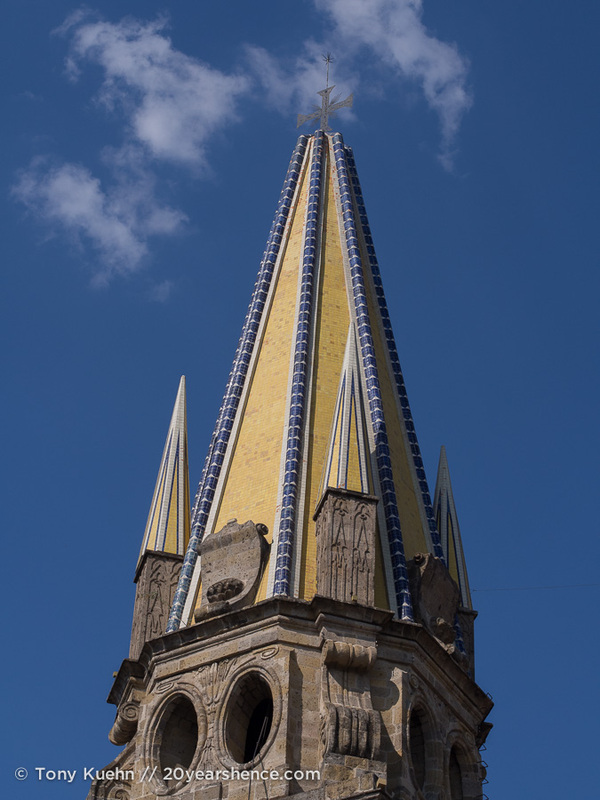 The most obvious choice was Guadalajara, a mere four-hour drive away and capital of the state of Jalisco. 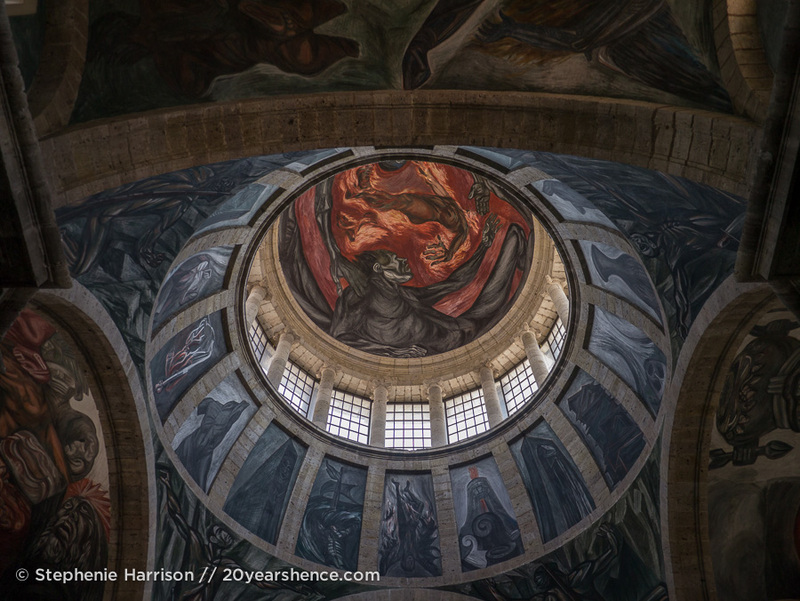 But everywhere we looked, all we could find were reasons NOT to visit: People found the city too gritty, and even bona fide Mexico lovers who had tons of experience traveling the country found it difficult to get a grasp on the sprawling metropolis. 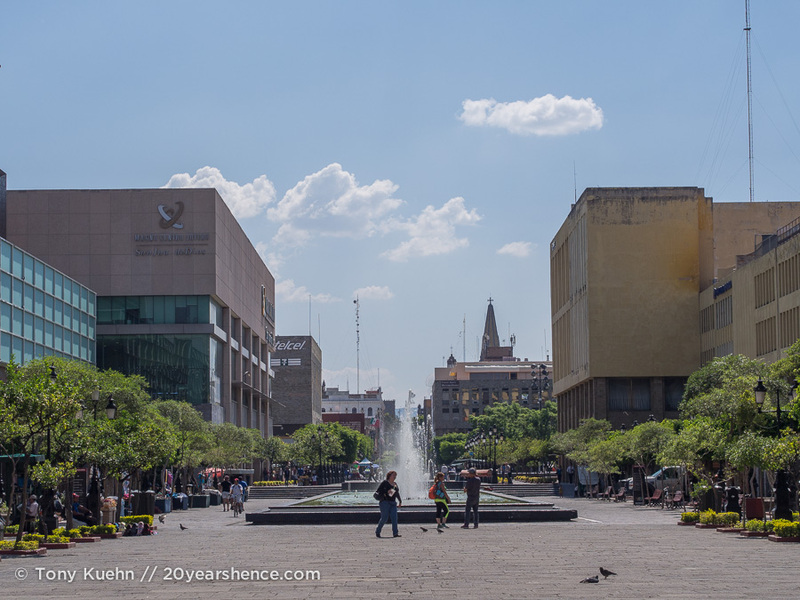 Given all the lackluster press, we felt daunted by the prospect of spending a month in Guadalajara, but we couldn’t deny that the city intrigued us. 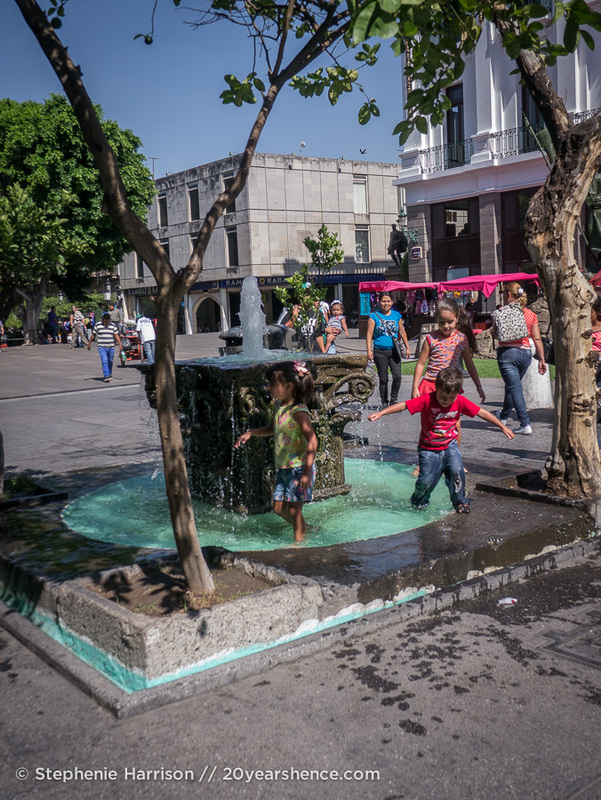 Despite all the naysayers, we felt drawn to Guadalajara. 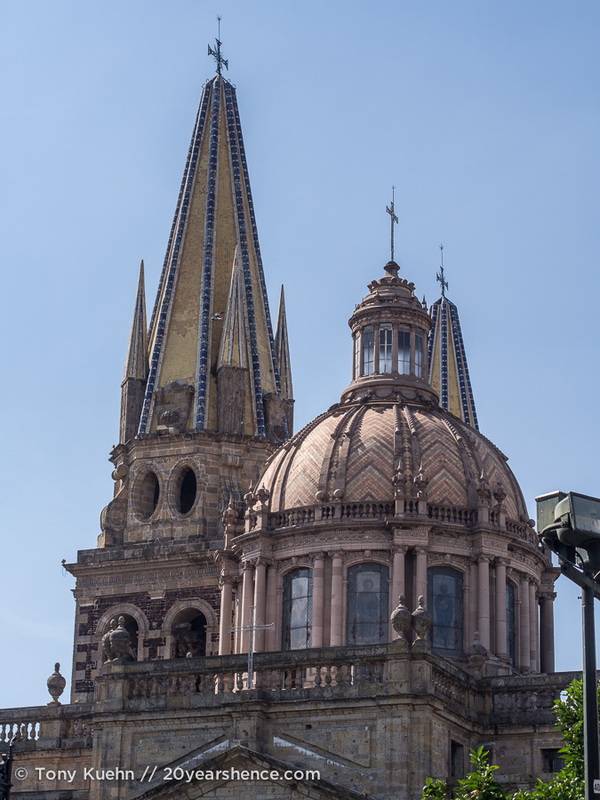 The city is the birthplace of so many quintessential aspects of what most foreigners consider to be at the core of Mexican culture: mariachi music, broad-brimmed sombreros (and the infamous Mexican hat dance), tequila, and rodeos… they all originated in Guadalajara. 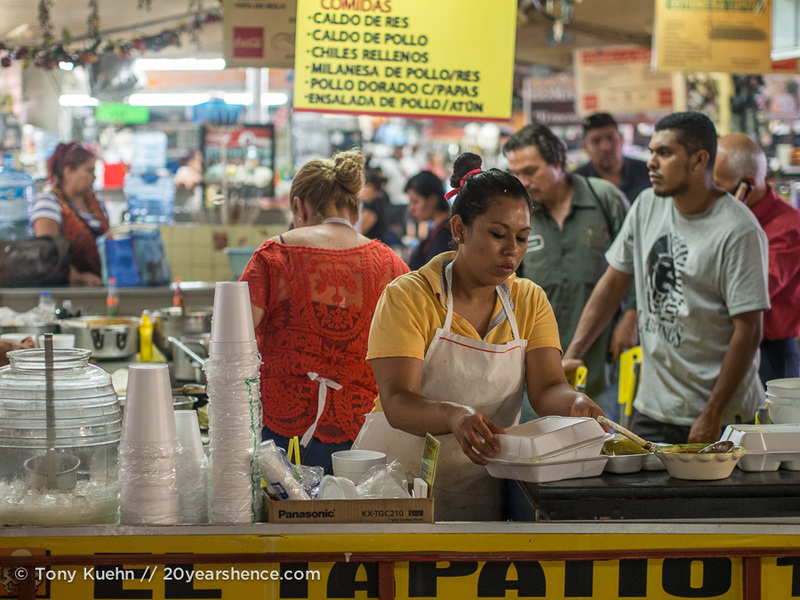 How could a place with that kind of lineage be soulless and devoid of “authentic” Mexican culture? 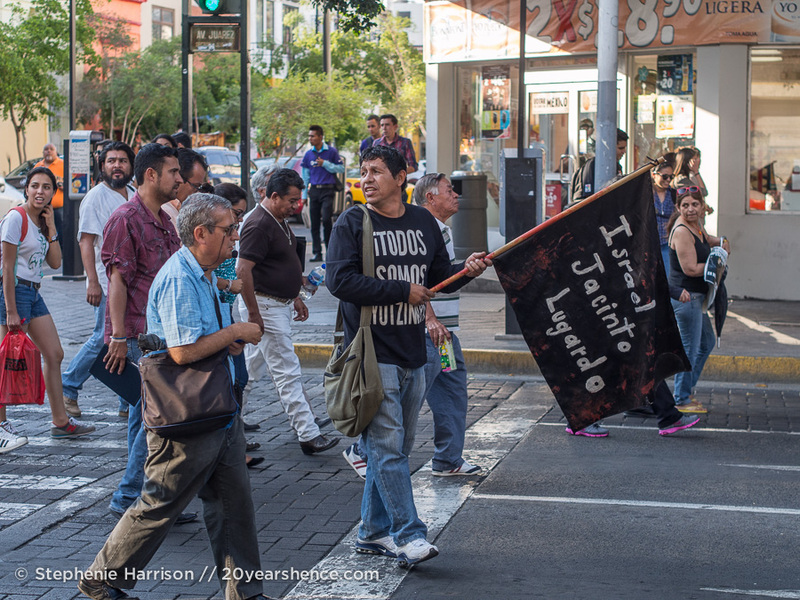 Moreover, if the place was so terrible, why have over 1.5 MILLION people decided to make Guadalajara home (and consequently made it Mexico’s second largest city!)? 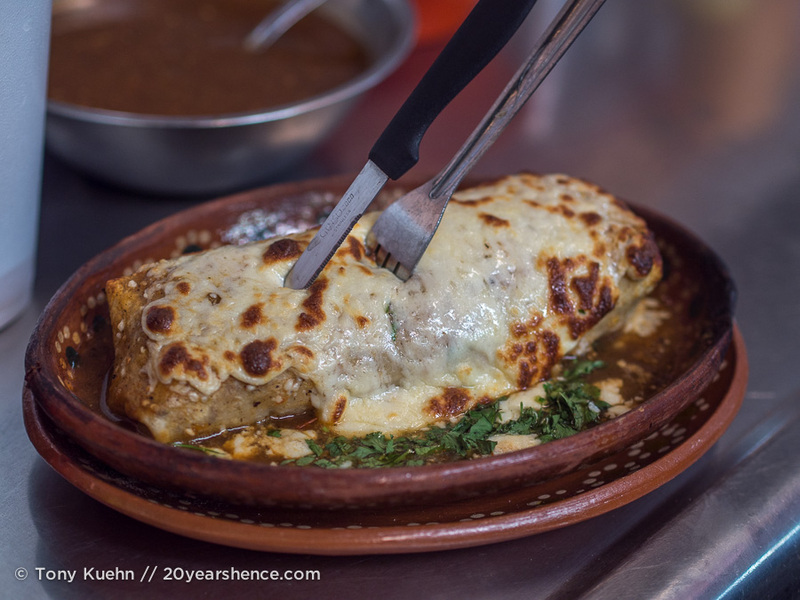 Something just didn’t add up to us, and when we read that Guadalajara is considered to be something of a foodie city, we decided to throw caution to the wind and give it a chance. 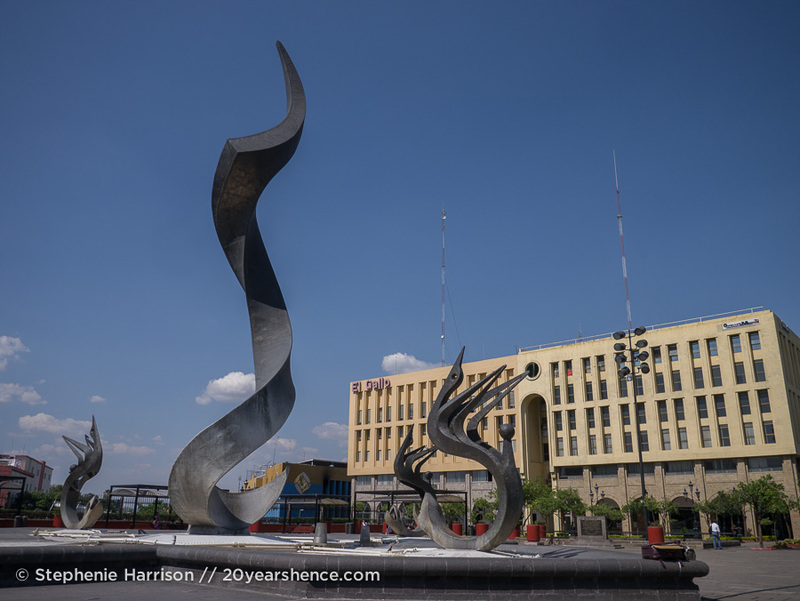 In fact, we found ourselves swiftly smitten by Guadalajara and spent our time there wondering how other people could not see its awesomeness. While it’s true that it is a really big city, we didn’t find that especially daunting as we simply limited the radius of our explorations to one specific area rather than trying to cover the entirety of the place in a single visit. We reasoned that even if we had lived for a month (maybe even an entire year!) right in the belly of the beast that we would still only scratch the surface of the place, so, we just took tiny nibbles here and there and found that was the perfect approach for us. We decided to focus our attentions and energies on the city’s historic core and I think that was the exactly right decision. 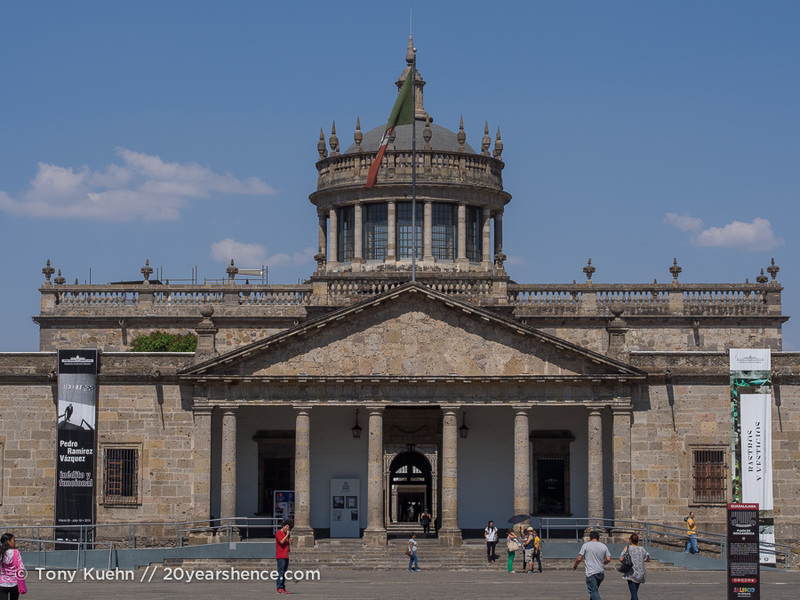 Although Guadalajara might be large and sprawling, most of its major tourist sites are tightly clustered within a square mile or so, and we found that we could easily wander this area on foot and see everything we wanted while also experiencing the energy of the city and enjoying the absolutely gorgeous architecture. 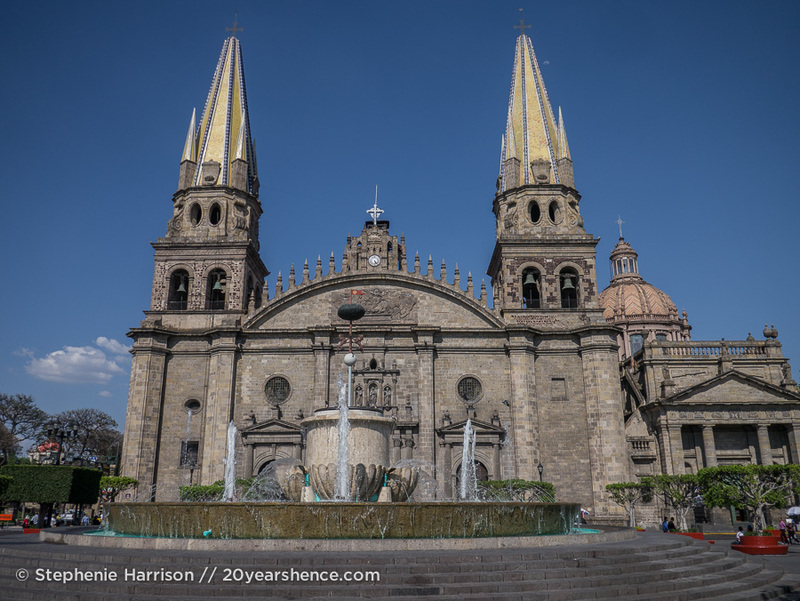 I can’t even tell you how many times we exclaimed variations on “This is just like Europe… only no one bothers to visit!” during our wander through Guadalajara. 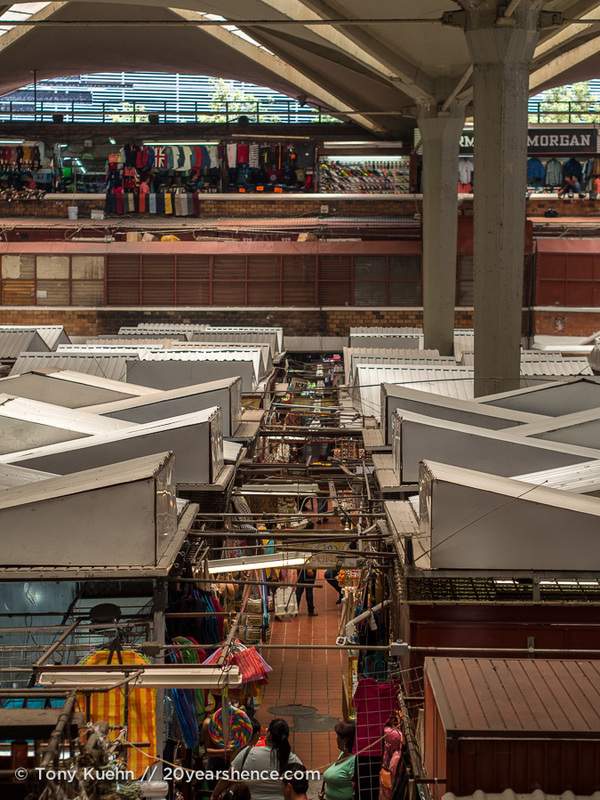 Visiting Mercado Libertad (also known as San Juan de Dios), the city’s main market, and the largest covered market in all of Latin America; you could easily spend an entire day just exploring this place! Like pigeons, we immediately homed in on the food area of the market which is crammed full of hundreds of puestos (food stalls) serving everything from sushi (!) to prime cuts of steak to seafood feasts. 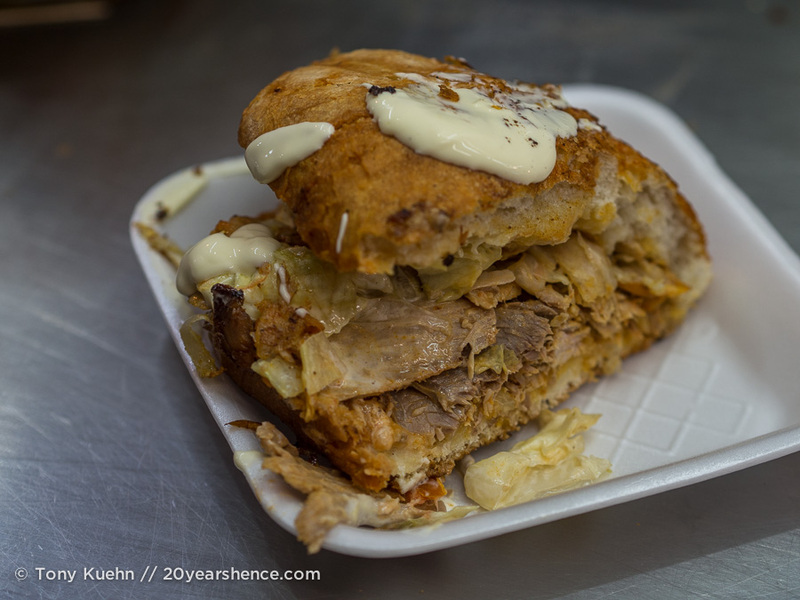 We experienced some serious choice paralysis and felt a bit like Theseus wandering the labyrinth, but eventually settled on an incredible torta down in the basement (they swipe mayo on the inside AND outside before grilling) and then trying something we had never seen before, a torino, which is essentially a cheese-covered burrito. Both of these dishes were so tasty and cheap that we immediately began planning to renting an apartment nearby so we could come back and eat here every day. 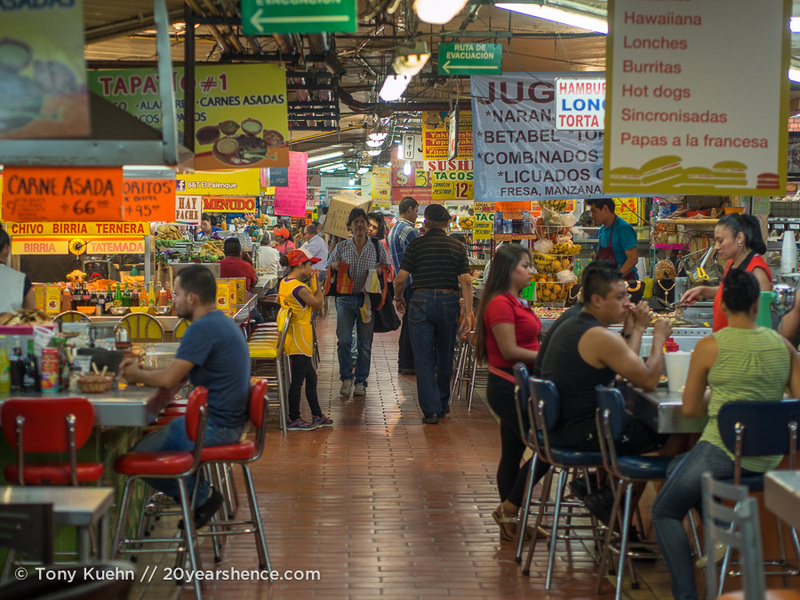 The food was definitely the biggest draw for us at Mercado Libertad, but the place is packed with pretty much anything and everything you could ever want (and probably plenty of stuff you don’t!). 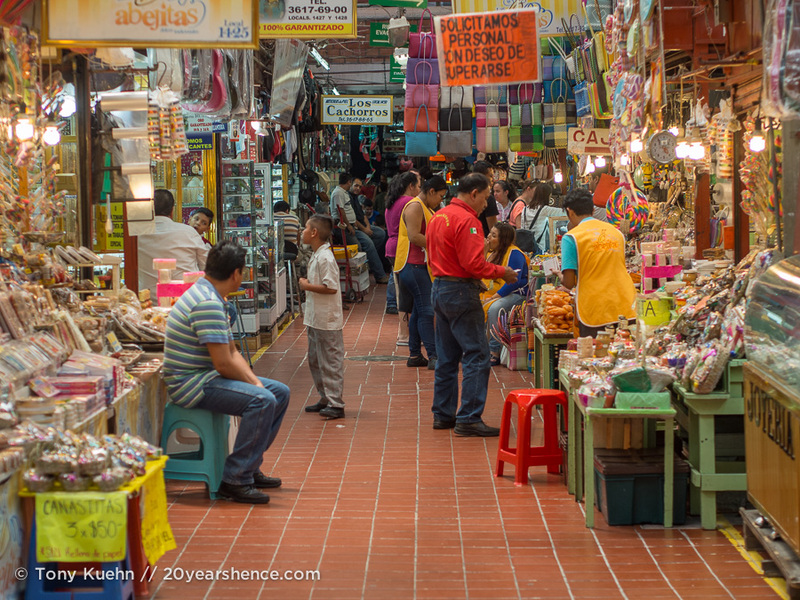 We saw bootleg DVDs and hand-crafted leather huarache sandals, traditional teas to sooth any illness and boost your (ahem) stamina and lucha libre masks… It’s a veritable hive of activity and, even for perpetual window shoppers like ourselves, a required stop for visitors and locals alike. 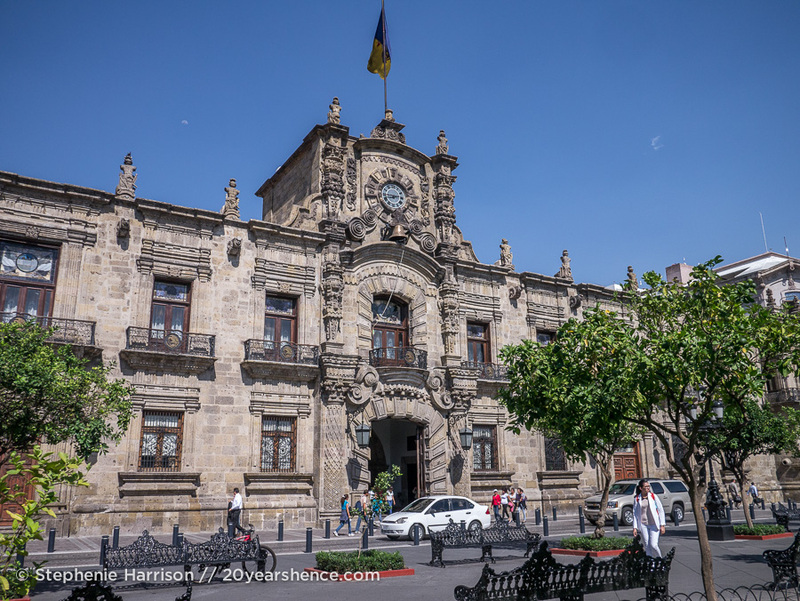 We also felt the Palacio de Gobierno, which is the home of the state government offices, was well worth a visit. Normally we don’t go poking around these types of places, but this one is open to the public (we just waltzed right in!) and has the most incredible (if slightly menacing) mural on the ceiling above the stairway leading off the main atrium. 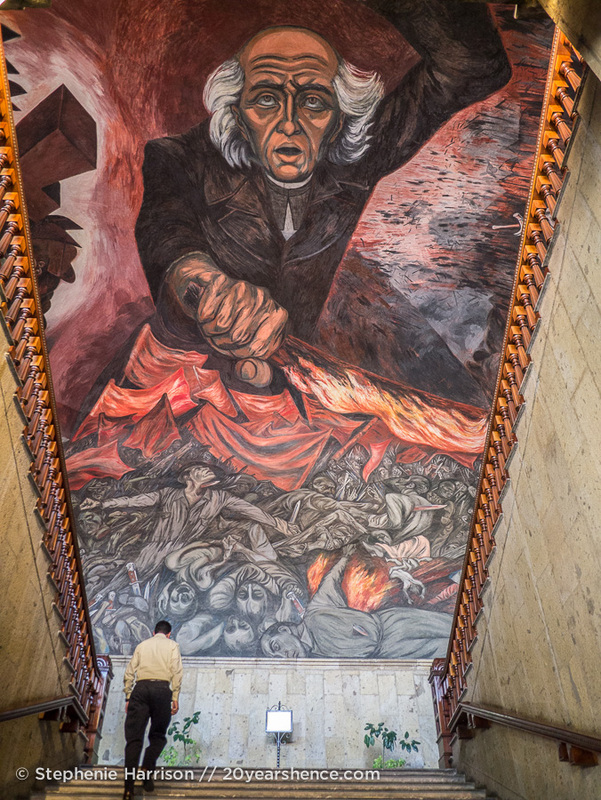 It’s really disorienting and dizzying to climb those stairs while Miguel Hidalgo brandishes a fiery torch at you, but also so very cool! 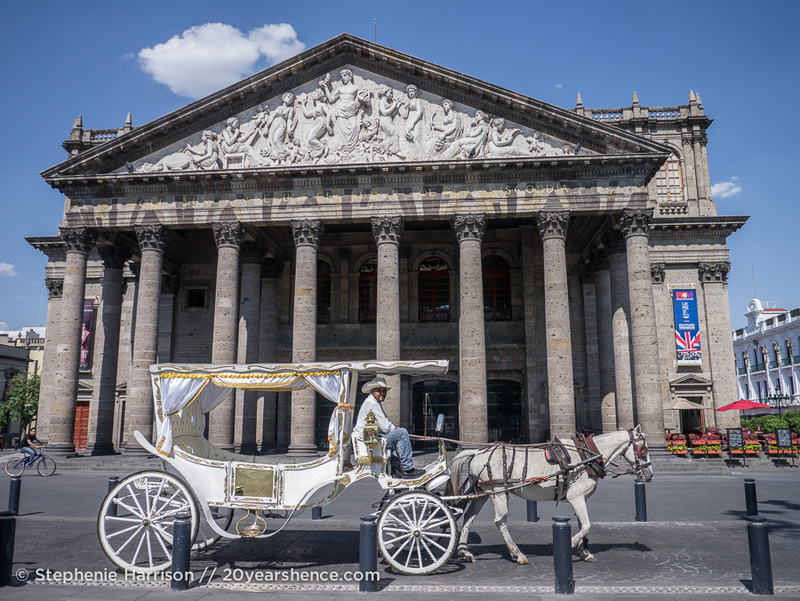 From there we wandered along the pedestrian street over to the Teatro Delgado, where horse-drawn carriages looking like something out of a Disney-princess fairytale circle the square. 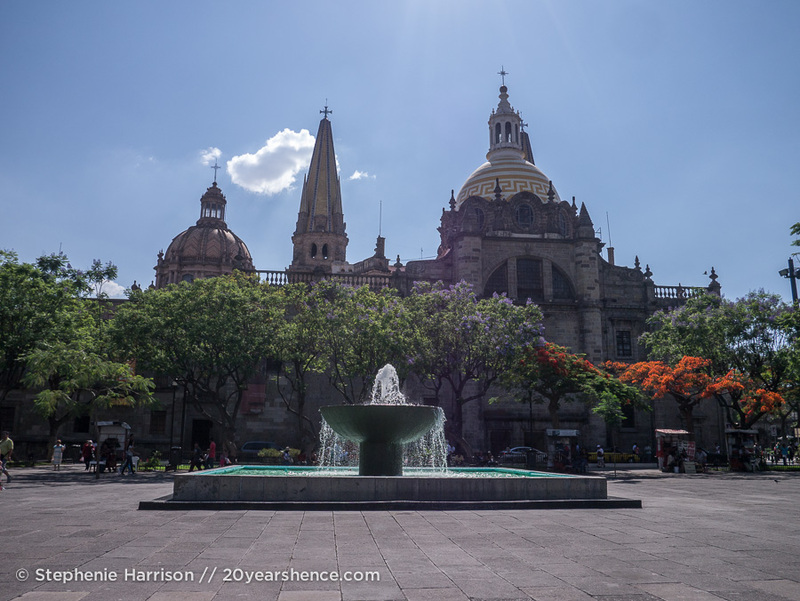 Then it was over to the Plaza de Armas, where the Cathedral de Guadalajara proudly stands. 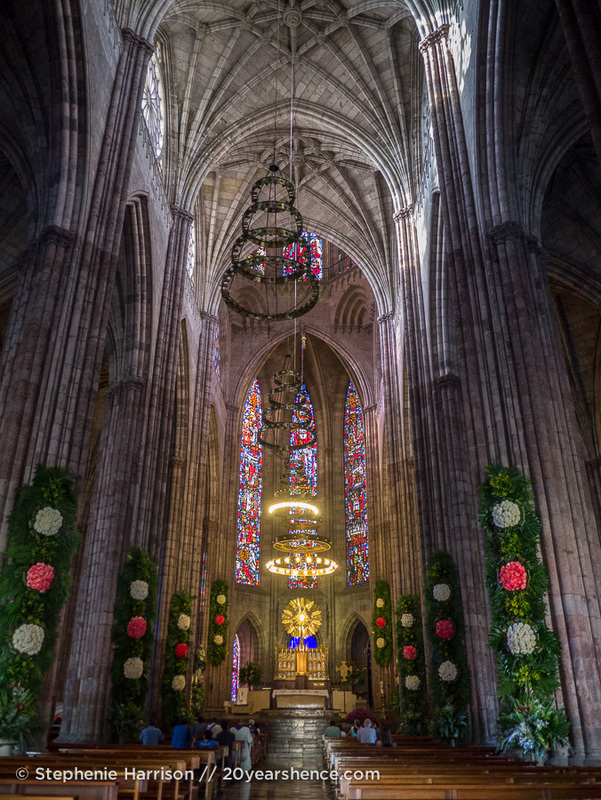 Construction of the cathedral began in 1558, just a little more than a decade after Guadalajara was founded (in its current location that is… the city had a few false foundings elsewhere), and was finished in 1618. Parts of it have been rebuilt due to earthquake damage over the years, but there’s no denying the history and significance of this structure. It’s also so massive that it’s really hard to take a picture of it that manages to get the entirety of it in a single frame. This plaza is a great place to hang out and simply soak in the ebb and flow of the city while people watching. 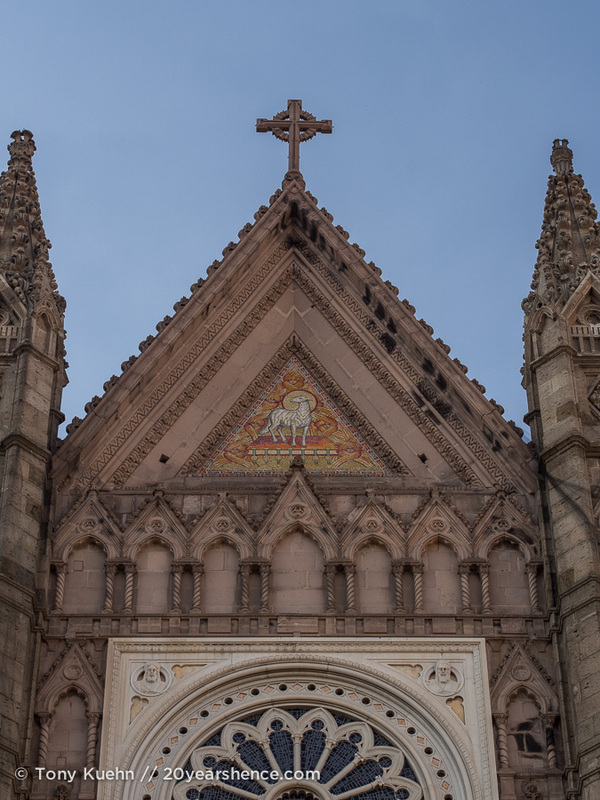 The Templo Expiatorio seems teeny tiny compared to the Cathedral de Guadalajara, but we were seriously impressed by its ornate stone façade… and the inside wasn’t too shabby either! 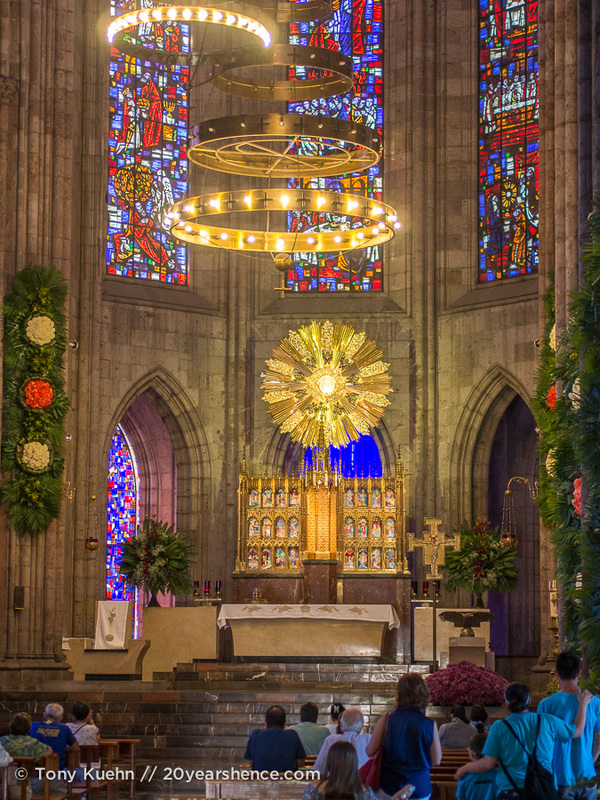 We had major flashbacks to our time in Paris, and felt this church could even hold its own against Notre Dame. It’s easy to feel swallowed whole and slightly lost in Guadlajara, but we honestly found it a pleasure to explore on foot, stumbling across unexpected gems and surprise treasures as we went. 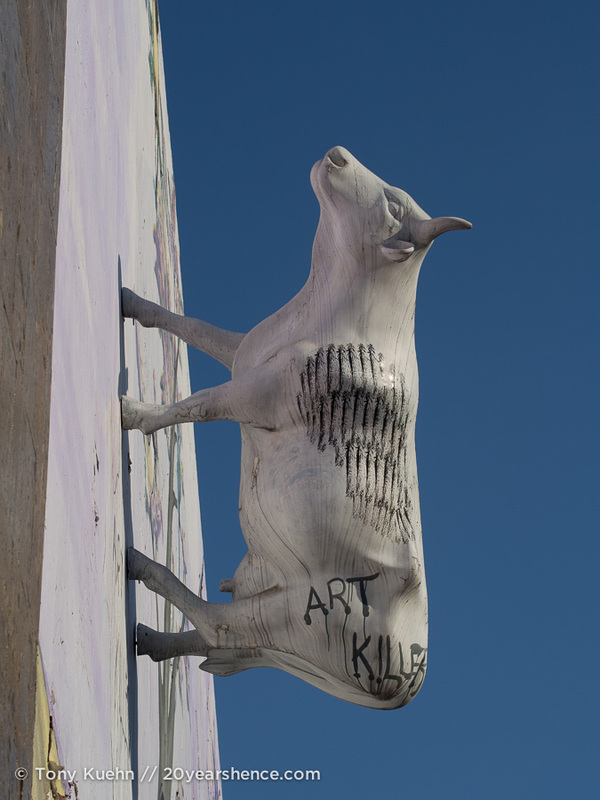 The streets are wide and breezy, and during our time wandering about, we witnessed a (peaceful) protest, serene and scenic plazas, and some rather trippy street art. 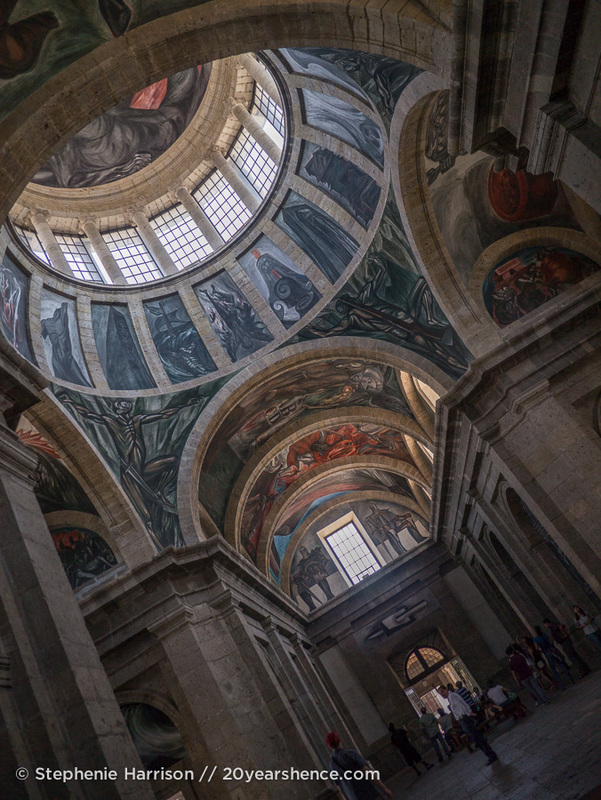 One thing I want to stress is that although Guadalajara’s historic center has many beautiful old buildings, it is not like walking through a perfectly preserved museum. Just like in Rome, the streets teem with life and the area has clearly adapted to the present. There are cafés and McDonald’s and shoe stores (like, a remarkably high number of shoe stores…) interspersed amongst art museums and 19th century government buildings and shady parks. 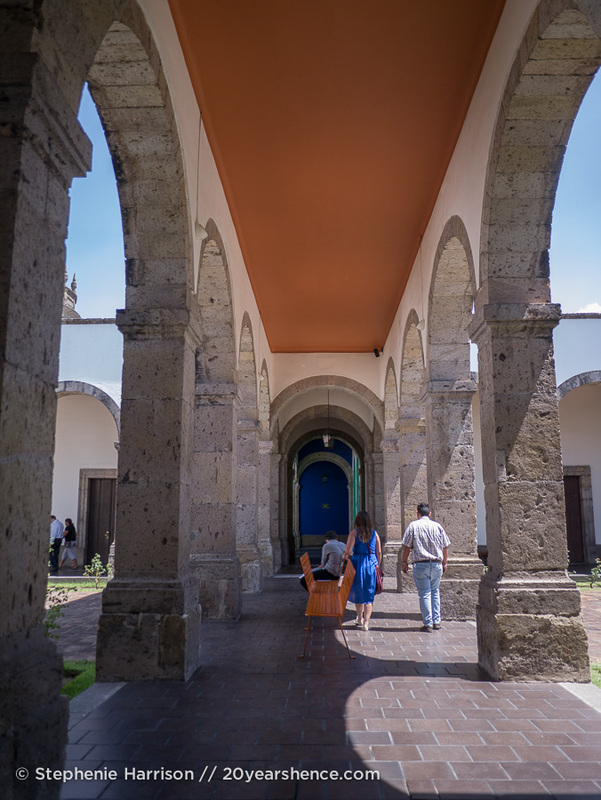 We personally found the mishmash of old and new—centuries old churches and horse drawn carriages sitting beside gleaming sports cars and modern department stores—to be really interesting and more representative of 21st century Mexico than some would like to let on. 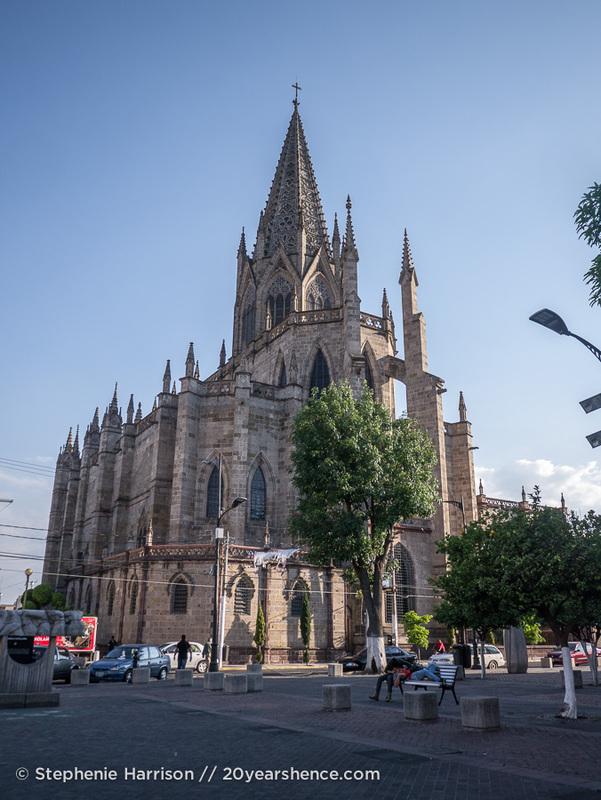 It’s cosmopolitan, but if you spend enough time walking its streets, you will see that Guadalajara still retains an unpretentious, down-to-earth Mexican vibe. The food is good and people are friendly… what more could you want??? Our reactions to places are so subjective and what’s true for one person certainly might not be the case for someone else; we didn’t find the city especially gritty (and remarked several times at how clean it was!) or charmless or threatening. 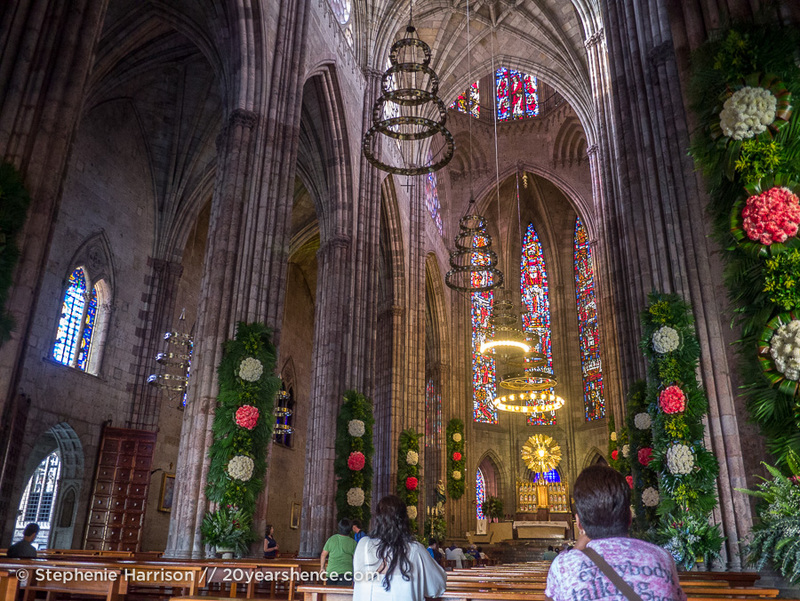 In the end, our only regret when it comes to Guadalajara is that we didn’t have more time to spend there! I wish we had popped our Tlaquepaque bubble earlier rather than feeling intimidated by this urban goliath. We immediately felt at home in Guadalajara and, although it might not match the image of quaint colonial villages that travel bloggers love to promote as the de facto Mexico, I certainly would not agree that Guadalajara is less of a slice of “real” Mexico than many of the country’s more popular tourist destinations (most of which I would argue have been cultivated and molded to conform and appeal to non-Mexican sensibilities). 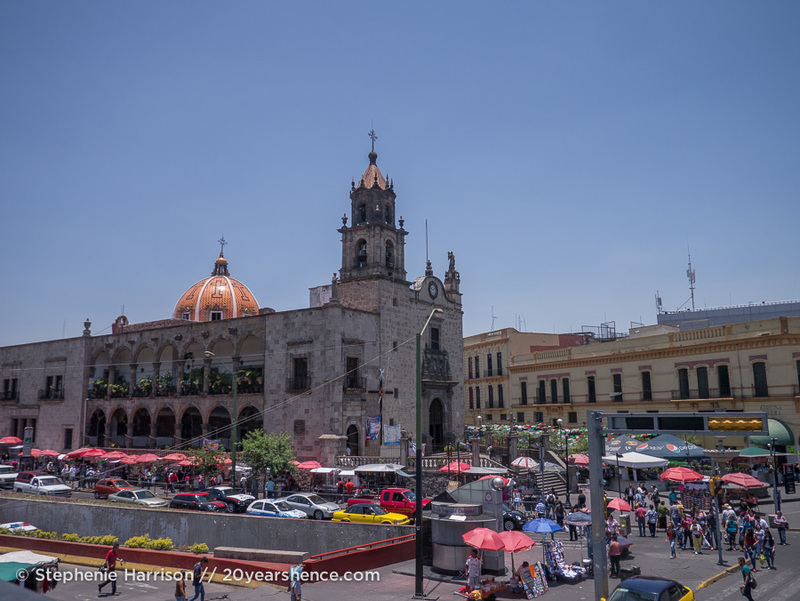 As big as Guadalajara is, Mexico itself is even bigger, and if our time here has taught us anything, it’s that there’s room for a lot of different kinds of Mexico within its borders. 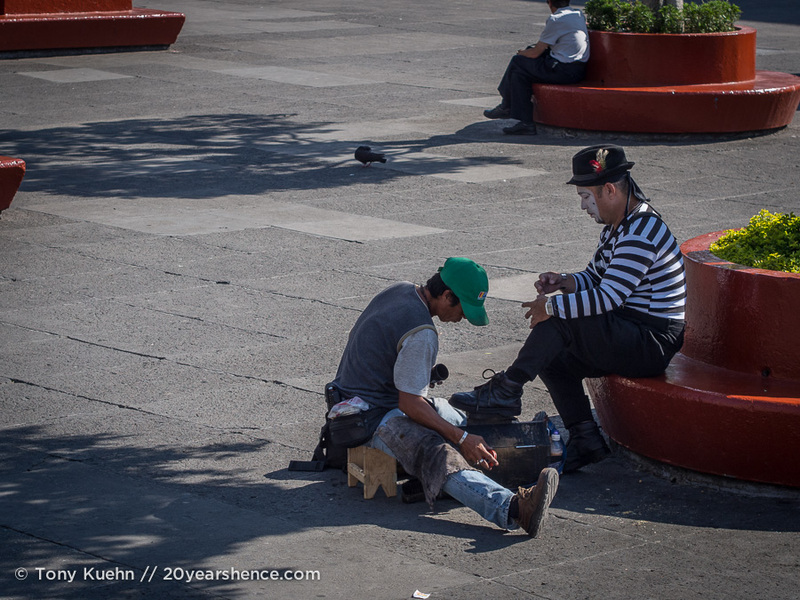 For us personally, Guadalajara is the type of Mexico we can’t wait to see more of. One day we’ll be back! 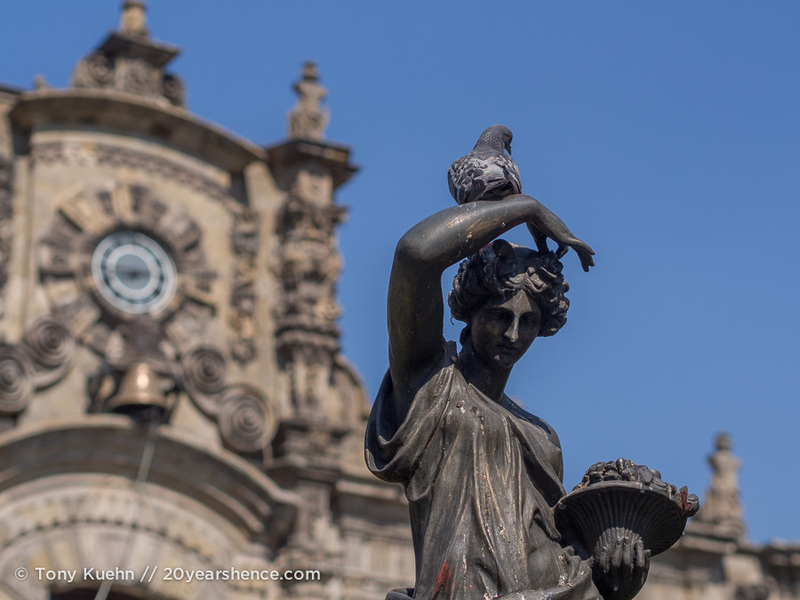 Tell Us: Have you ever visited Guadalajara? If so, what did you think? If not, have we convinced you it’s worth visiting? Have you ever visited & loved somewhere that others tried to warn you off of? I am quite the contrarian so generally someone telling me not to go somewhere just motivates me to do the opposite. I totally accept and respect that people will have different reactions to the same thing, which is why I think it’s so important for bloggers to try to express not just whether some place was good or bad (in their opinion, of course) but WHY they feel that way. 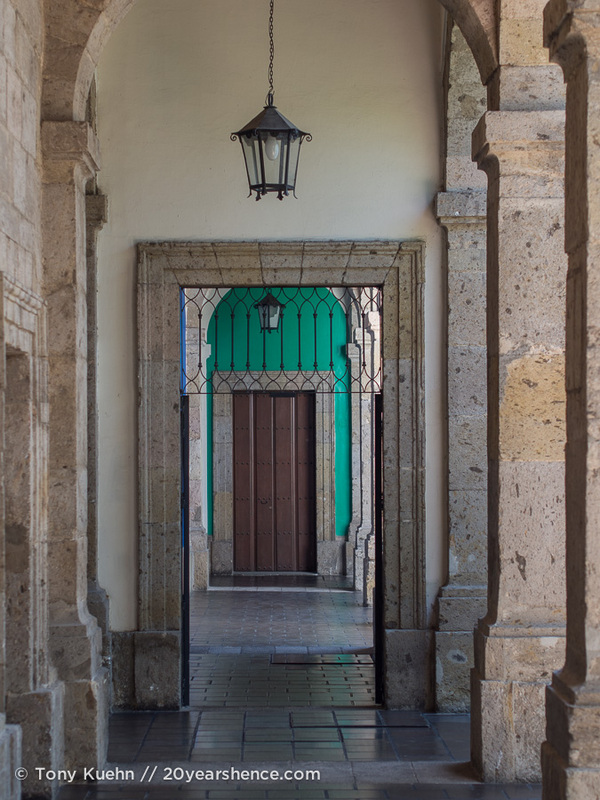 If you really hate cities and don’t like beautiful Spanish-style architecture, then I guess Guadalajara won’t be for you… but I really find that hard to believe! Do you guys plan on checking out Guanjuato at all? I’ve always wanted to go and actually have a former student who is originally from there. It looks amazing. I have no idea where it is in relation to where you guys plan to travel, but it’s always been a place that’s intrigued me. Hi Jenn! We would really like to visit Guanajuato at some point, as we’ve also heard really great things about it. It’s hard finding long-term lodging online there that is affordable which is part of why we haven’t visited yet (with the dogs, we like to try to have this kind of stuff sorted before arriving), but I am sure we’ll figure something out because it looks too pretty to miss. 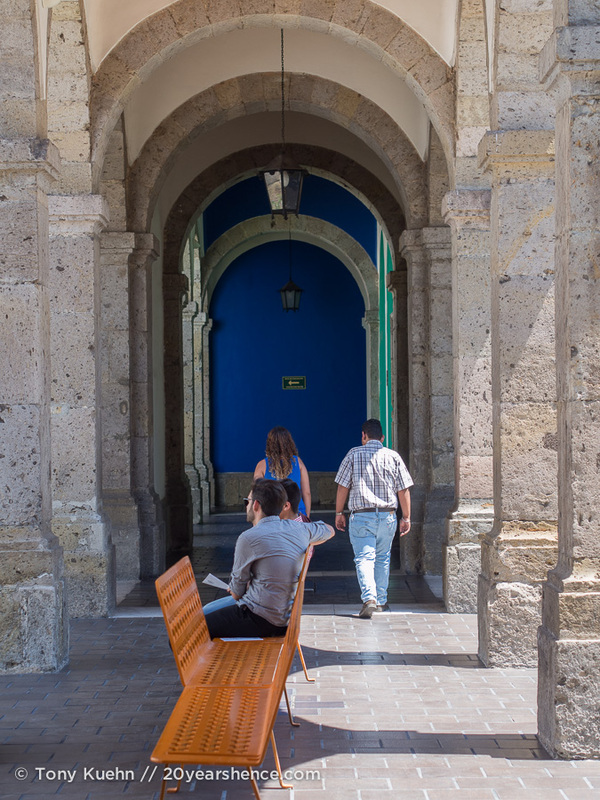 Many people we know consider it their favorite city in Mexico, so it seems like the kind of place we should try on for size. Probably won’t make it there for a while, but I can’t see us visiting Mexico and missing it! Yup. We have loved places that others have panned and vice versa, so we know that the only way to know for sure whether a place works for us is to just visit it and see for ourselves! 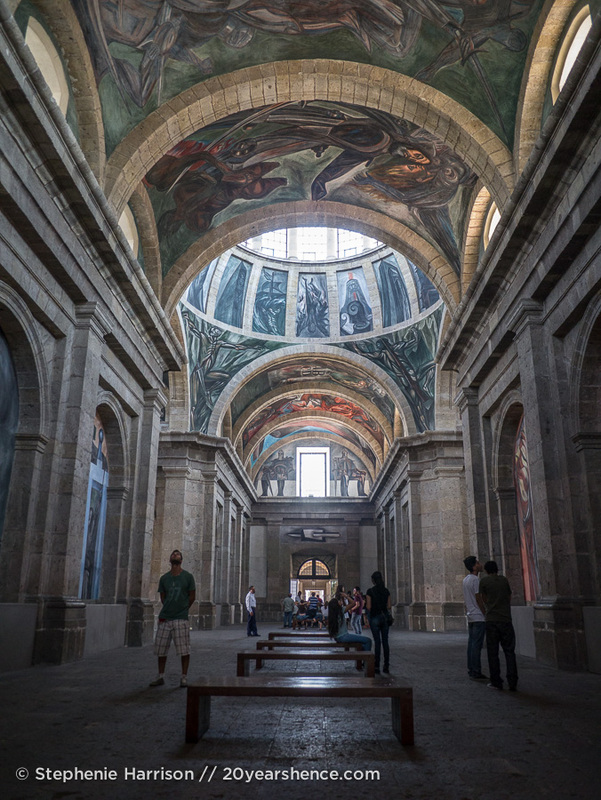 I’m glad we trusted our intuition and thought deeply about what the kind of places that tend to work for us… Guadalajara looked great on paper (to us), and I’m happy that the reality didn’t disappoint! P.S. 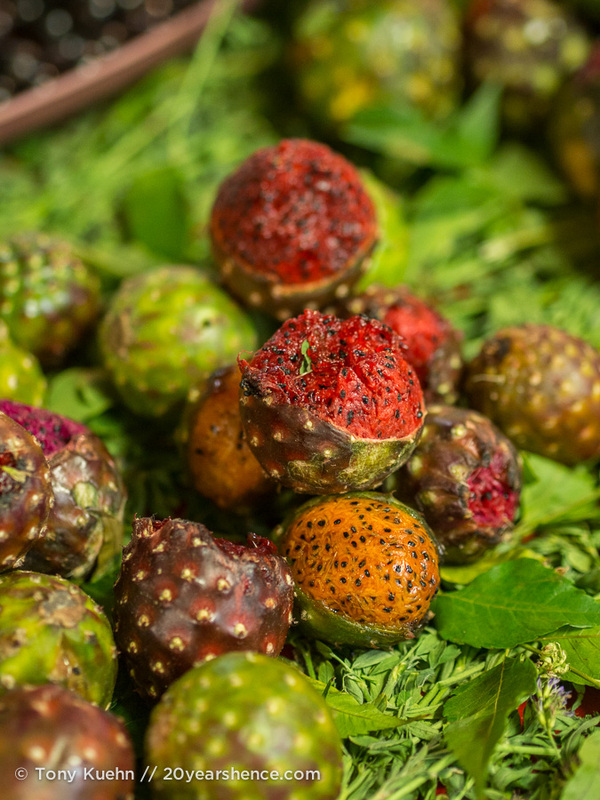 the fruit at the market looks lovely! Absolutely, Amy. Although we certainly won’t lie and pretend to love a place if we didn’t, we always feel like we need to explain why a place did or didn’t work for us. Of course, sometimes its totally subjective and things that bothered you one place wouldn’t have phased you in another, but that’s worth mentioning too. There’s no shame in not loving a place, but assuming that others should/will feel exactly as you do is definitely a problem. The only way to know whether a place is or isn’t for you is to go visit it for yourself, so that’s why we’d never tell people NOT to visit somewhere! I agree! 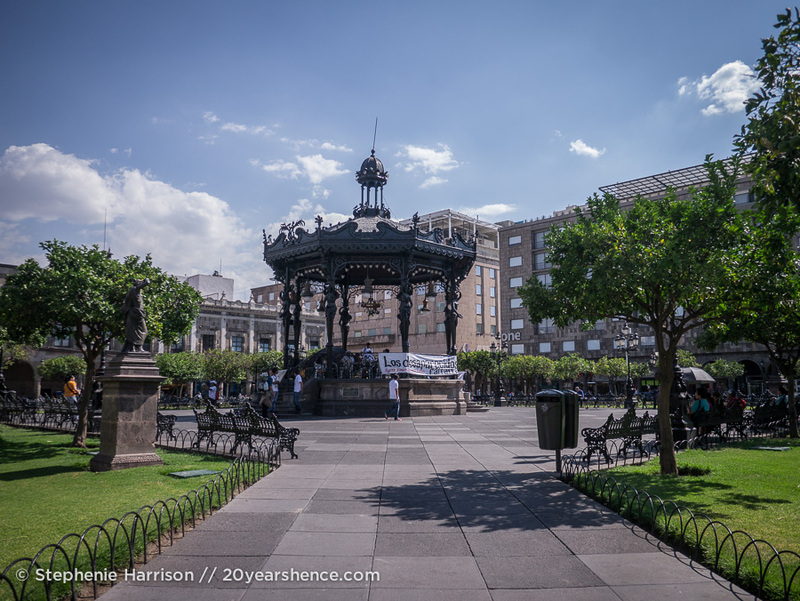 I live in southern Mexico but have enjoyed a few trips up to GDL and love the city! I’m in San Cristobal de las Casas, if you’re route brings you down here we could grab a coffee. Hi Jess! So glad to hear that you too have been charmed by Guadalajara! Also, San Cristobal de las Casas is on our list of places we definitely plan on visiting, so when we make it to your neck of the woods, we’ll be in touch. We’re currently in Oaxaca and plan to head to the Yucatán next, but after that, I think a trip to Chiapas will probably be in order! This city looks quite nice to me. In fact, just the type of place that I would visit and like. I’ve never visited Mexico but I hope to visit Peru, Costa Rica, and Mexico in the future as I live countries and places with historical significance. Have I ever visited & loved somewhere that others tried to warn me off? Sure! Everytime that I say that I’m going to Poland, my German friends just can’t understand why, and don’t get me started on India….! I’ve been to Rajasthan and even though I hated the train expereince and was completely exhausted after my solo travel, I want to go again. This time to Mumbai! Everybody seems to hate it but I just know that I would like it completely as I think I would be able to see beyond the dirt and dismal poverty and see the fascinating history, the culture and the art. At least, I hope so. I didn’t like Delhi but Mumbai is a different kettle of fish LOL! Victoria@ The British Berliner recently posted..If you want to make a statement, make it trashy, make it bizarre, make it the Berlin Music Video Awards! What a fabulous blog title! I love it. It looks like you found a great place to visit and it is good that you followed intuition rather than subjective advice. It looks fascinating and with the key highlights being within a mile walking distance is a big plus. And who doesn’t love free access on Tuesdays! We are definitely happy with our decision to visit Guadlajara—I hope other people considering visiting find this post and that it may encourage them to give it a try too. I am also certain that there is way more to see in the city than what we managed to cover (even within its historic district), so I’m certainly keen to return myself and see what else we can uncover! 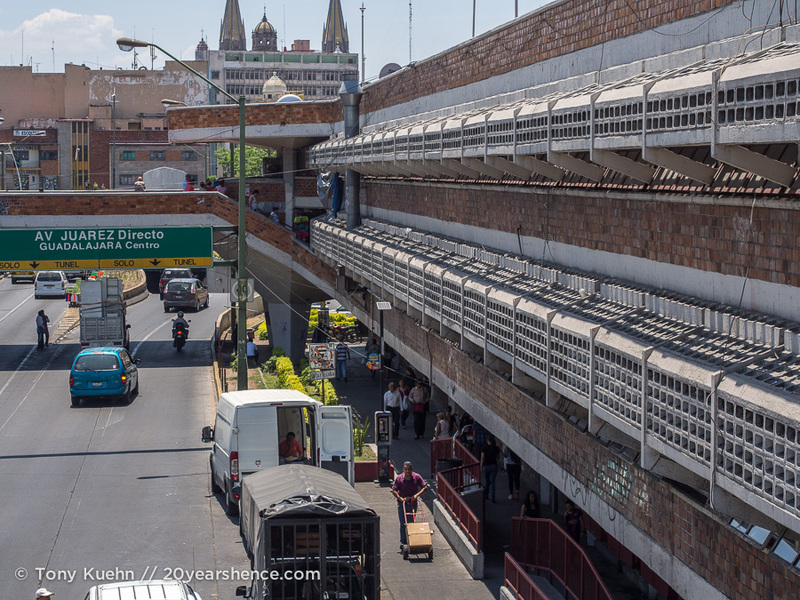 I actually had no concept of Guadalajara in my mind before reading this article. But I think it looks gorgeous!! And yes, I’ve had fun before in places like Surabaya (Indonesia), Tehran (Iran), Aqaba (Jordan) and Perth (Australia) where people told me it wasn’t worth my time!! Loved all those places! Tim UrbanDuniya recently posted..What is a burger baccha? Wow, I’m so happy to hear how much you took to GDL. I was in my own little neighbourhood bubble when I was there, hence the concentrated area of restaurants I recommended. It’s true, you could eat your way through this place and never get to the end of it all. You were also much more successful in “scratching the surface” than I was. I can’t say I had very strong opinions about the city one way or another because most of my time was spent at the school (which was a 40 minute bus ride away from where I was living which was already far from the centre) and I was sick a lot 🙁 (!!!) but my few adventures around GDL were always positive. I did see some gritty areas but for the most part found the place to be modern and Mexican all at once just like you. 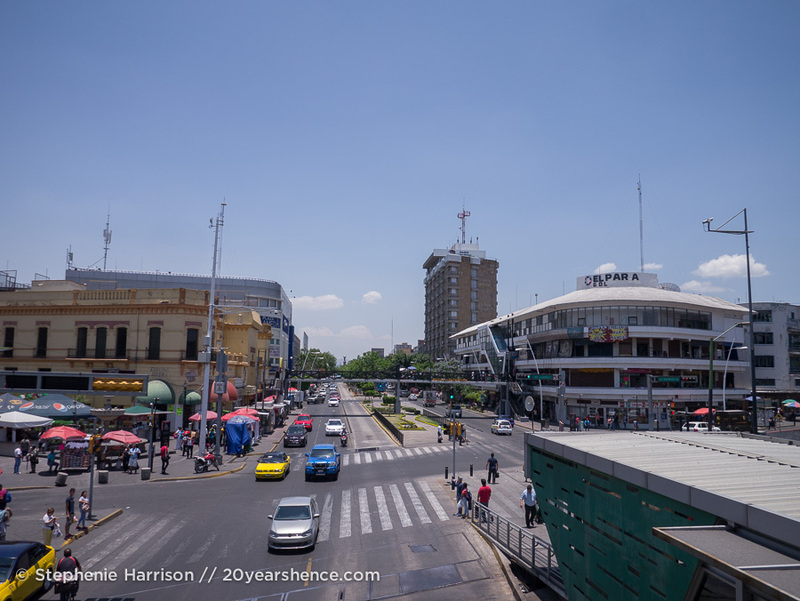 Guadalajara is a bit of a sprawling beast, which is why we focused on just one or two areas (sadly, we didn’t make it to Zapopan, except once when we went to Costco to get dog food for the pups and to go see a movie!) so I definitely don’t blame you for doing the same, especially since you were relying on public transport! Thank you so much for sharing your positive experiences with us when we were trying to decide whether to go or not—you definitely helped us decide to take the plunge (as it were) and we’re so glad we did.